We're in full currant and blueberry season, and raspberry bushes are bursting and ripe for the picking. 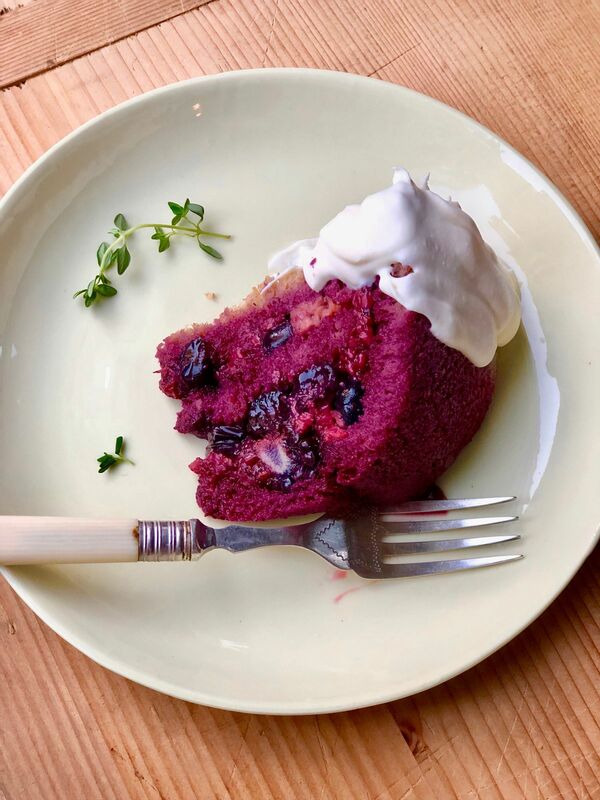 This is berry season in all its glory, so instead of forming hand pies and churning ice cream or heating the oven to bake a cake, I'm going with this simple, late-summer dessert that turns fruit and bread into a gorgeous dome of purple, garnet and magenta. The berries are best firm, slightly tart, and I like a combination of raspberries, blueberries, blackberries or even black currants and strawberries. The idea is to use what's fresh and available. As for the bread, its job is to soak up the juices, so it needs enough texture and density to hold its shape, without being too dense in order to allow the juices to soak through. And it should be soft enough but not so soft that it turns into a soggy mess. A good, white Pullman or sandwich loaf that's a few days old works well, as does potato bread, which also has the right texture. I sometimes make this with whole grain bread or a loaf of challah sliced into ½-inch thick slices. As for the dish itself, use a 5- to 6-cup bowl that can hold the bread and the juices. I've made this in a loaf pan and a springform pan, as well as in individual ramekins. Think about the way it will look once you've unmolded the dish; I prefer a domed bowl if presentation is important. And for serving, a pour of thick, heavy whipping cream is best, but I tend toward crème fraîche, which adds extra tartness or even a spoon of good plain yogurt or vanilla custard. 1. Discard any berries that are too soft or moldy; remove stems as well. Place berries in a medium saucepan over medium-high heat. Add 1/4 cup sugar, lemon zest, juice, star anise or cinnamon and water. Bring to a low boil and shake pan so the sugar begins to dissolve. Cook 2 minutes. Taste and add more sugar, if needed, but keep in mind that you want the tart fruit to really shine. Lower heat to medium-low and let fruit gently simmer another 5 to 6 minutes and until juices begin to bubble but fruit remains whole. Remove pan from heat and let cool. 2. If using a whole loaf, slice bread into ½-inch thick slices. Remove crusts and keep for another use, such as breadcrumbs or bread pudding. Now, think of this part as a jigsaw puzzle where you'll be making the pieces fit together snugly. Depending on the size of dish you're using, place a whole slice in bottom of the dish and up the sides as well. Cut some of the bread into triangles or soldiers —long thin strips — and fill in the empty spaces so the bread all fits together. You want a single layer of bread covering the whole inside of the dish. Remove whole star anise or cinnamon stick and discard. Spoon in about half of the berry mixture with juices. Add another single layer of bread just over the fruit and pour over remaining fruit and juices. Top the dish with another layer of bread, pressing down so that all the fruit is covered. Cover tightly in plastic or aluminum and set a plate over; it should be just slightly smaller. Set a heavy skillet or other weight to smash down the bread and fruit. Place dish on a pan or larger plate to catch any juices and chill in refrigerator overnight. 3. To serve, remove pudding from refrigerator and remove weights/skillet and plastic wrap. Take a thin rubber spatula and gently slide it around the bowl, between the bowl and bread. Place a serving plate (larger than the rim of the bowl) over the pudding and swiftly turn the bowl upside down, shaking gently. If pudding doesn't unmold right away, let bowl sit upside down on plate and gently shake again. It should dislodge. Remove bowl and serve with heavy cream or preferred accompaniments. Kim Sunée is the bestselling author of "Trail of Crumbs: Hunger, Love, and the Search for Home" and "A Mouthful of Stars." Her new book, "Everyday Korean," is out now and available at Barnes and Noble and Amazon. For more food and travel, visit kimsunee.com and instagram/kimsunee.